A $1 million commitment from The LOPen Charities and The Scott and Julie Mawaka Charitable Foundation has led to the creation of an endowed chair at Akron Children’s Hospital’s Showers Family Center for Childhood Cancer and Blood Disorders. The LOPen Charities and Mawaka Family Chair in Pediatric Hematology/Oncology was established by Scott and Julie Mawaka and Phil and Jen Lopez to recognize the leadership of Dr. Jeffrey Hord, director of the Showers Family Center for Childhood Cancer and Blood Disorders at Akron Children’s. Funds supporting the chair will enable Dr. Hord to pursue innovative programs and efforts to advance patient care and education. The new chair will provide funds for patient care initiatives, including facility improvements, as well as support for family needs, opportunities for staff education and purchases of new equipment. The Akron Children’s Hospital Foundation has committed to raise an additional $500,000 for the endowed chair, making it a planned $1.5 million endowment. The newly announced endowed chair marks nearly $2 million that the LOPen Charities has raised for the Showers Center. 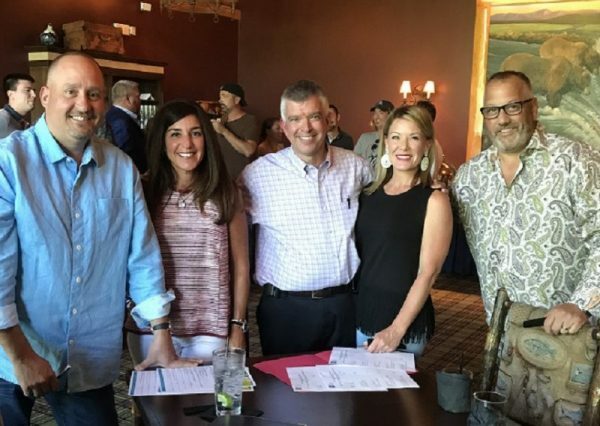 The LOPen Charities has supported the Showers Center through its charity events, an effort begun by Phil and Jen Lopez and Brad and Jen Croce in 2003. The Mawakas began collaborating with LOPen in 2016 and helped expand Rockin’ FORE the Kids, a weekend-long charitable event that includes music, fine dining, an auction, and golf in Northeast Ohio. This year, the June 29-30 weekend included a golf scramble, a Steven Tyler concert at the Hard Rock Rocksino, an auction, and a celebrity chefs event. Funds raised in 2108 through 2020 will go toward the $1 million for the chair. At Akron Children’s Hospital, chairs support the advancement of patient care, research and education programs. Established through a philanthropic commitment, a chair provides an annual source of income to enable the chair holder to pursue innovative programs and efforts. The Showers Family Center serves approximately 100 new children with cancer each year, as well as more than 600 patients with hemophilia, sickle cell and other bleeding disorders through approximately 12,000 patient visits annually. To learn more about the The LOPen Charities and Mawaka Family Chair in Pediatric Hematology/Oncology please contact Brian Hollingsworth via email or by calling 330-543-8340.